The manufacturer claims that this product can plump, firm, and hydrate the skin. They argue that it is the best anti-aging serum and Retinol cream. This is an extremely bold claim. In this review of Beauty Skin for Life Anti Aging Night Serum Retinol, we assess the truth of this claim. By providing quality product information, we will outline whether you should consider it for purchase. Retinol, a derivative of Vitamin A, supports collagen production and promotes healthy cell development. As a result, it can reduce wrinkles and even discoloration. Vitamin A stimulates fibroblasts, the cells that develop skin tissue. Subsequently, it keeps the skin firm. Vitamin E fights off damaging free radicals. This may lead to a healthier looking skin tone. Beauty Skin for Life states that Anti Aging Night Serum Retinol contains fruit and plant acids, however, they do not mention what they are. This is very concerning as we cannot be certain how these acids are benefitting the body. Furthermore, the manufacturer does not clearly outline the ingredients. The manufacturer merely eludes to the ones we have listed above. It is also concerning to note that it does not contain clinically proven patented ingredients. Several competitor products contain up to six of them. Patented ingredients have been well researched and tested. As an example, SYN-COLL outperforms market benchmarks in reducing the appearance of wrinkles. Therefore, these competitors will likely provide better results in comparison to this formula. Another concerning factor is that there is no mention it is animal-cruelty free or vegan-friendly. The manufacturer states that this product is for daily use, however, they do not provide any instructions. This is very concerning as we cannot assess the frequency of application or the best method of application. The Retinol concentration is sufficient, however, this may prove too strong for sensitive skin. They do not provide additional ingredient concentrations. Therefore, we cannot assess the product’s complete strength. The product can be bought from the manufacturer’s online store. A 30ml bottle costs $20. It has been reduced from $77. This is a substantial saving. However, the product’s effectiveness is questionable as it does not contain any patented ingredients. Therefore, the low price is justified. If you seek better results, then you may need to consider a slightly pricier yet more proven alternative. The manufacturer does not offer any bulk-buy or package deals to ensure long-term use is cost-effective. Despite further research, there appears to be no mention of a guarantee. This is extremely concerning as the manufacturer has the right to forfeit any refunds for ineffective products. This suggests that they are not confident. This does not bode well for efficacy. Furthermore, there are insufficient customer reviews. As a result, we cannot be sure of its quality. 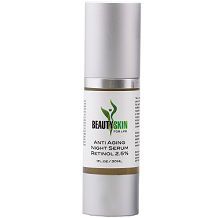 Beauty Skin for Life Anti Aging Night Serum Retinol has several positive attributes. It is relatively affordable and contains certain beneficial ingredients. However, the price is likely due to the fact that it doesn’t contain patented ingredients. As a result, it will not provide optimal results. Furthermore, there is no guarantee and insufficient customer reviews to assure effectiveness. Therefore, we do not recommend this night serum.